Aonach Mor is a 4,006ft mountain that is best described as "the next but one along" from Ben Nevis when seen from the north or north west. When combined with its slightly higher southern neighbour Aonach Beag it makes an excellent hillwalking expedition. 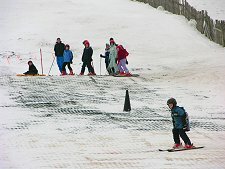 Since its construction in 1989 the northern slopes of Aonach Mor have become much better known as the home to Nevis Range. A mountain gondola whisks visitors from a base station just off the A82 midway between Fort William and Spean Bridge. The gondola's top station lies at a height of 655m or 2,150ft, where you find a range of facilities including the Snowgoose Restaurant. 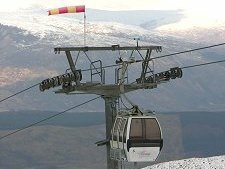 There are many reasons to take a gondola ride at Nevis Range. For some it is a means of avoiding the lower slopes of the mountain while still being able to experience the high mountain environment of its summit. Less ambitious hillwalkers can, especially in summer, take the mountain path which lead to a viewpoint at Sgurr Finnisg-aig, a 40 minute round trip. The slightly longer walk to Meall Beag offers superb views to the west and north. 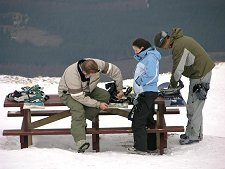 Nevis Range is accessible to visitors in wheelchairs. There are reserved car parking spaces opposite the entrance to the base station and disabled toilets at top and bottom gondola stations. 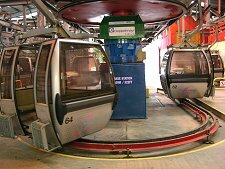 The gondolas can be stopped to allow easy boarding: while most wheelchairs can be accommodated by them. 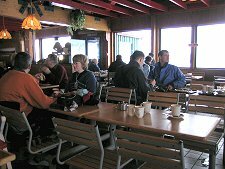 At the top station, the Snowgoose Restaurant and balcony area are both accessible. 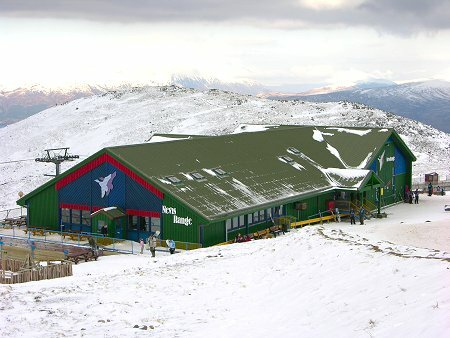 For Winter visitors Nevis Range also offers extensive high level ski slopes, with a network of 12 chairlifts and ski-tows giving skiers and snowboarders access to 35 runs. These range from beginners' routes through to very difficult runs rejoicing in names like "Chancer". Off piste skiing is also possible in the Back Corries area of the resort. 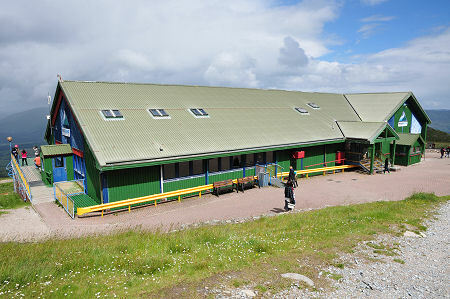 Mountain biking has become another sport to make use of the unique facilities on offer at Nevis Range. There are 25 miles of marked trails on the lower slopes of Aonach Mor, ranging in difficulty from "easy" to "expert". Bikes can be hired from the base station in summer. 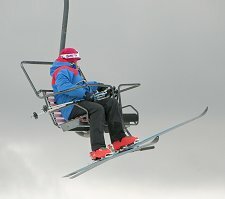 The gondola may also be used to give access to the top of the UK's only world class downhill mountain bike track. From the top station a 2.82 kilometer track drops 555m and the record for the descent was 4 minutes and 35.7 seconds during the 2010 World Cup: an average speed of 39km per hour. The track is open daily over the summer, but is graded "Orange Extreme" and is only recommended for experts. The Mountain Bike World Cup is held here each year. 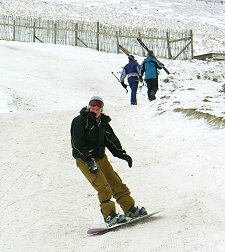 In recent years Nevis Range has also become popular with paragliders and hangliders. The gondola offers an easy way to reach a take-off altitude of 650m from either the Sgurr Finnisg-aig or Meall Beag viewpoints. Flying amongst Britain's highest peaks is a spectacular and challenging experience. All pilots are welcome to make use of the facilities, though hanglider pilots should give prior notice to allow their aircraft to be carried on the goldolas.